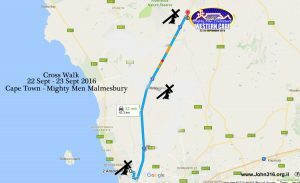 I will be leaving tomorrow morning walking with the cross Thursday 22nd Sept 2016 from Table View to the Moreson farm where they having the Western Cape Mighty Men conference from the 23rd-25th Sept this year. I will walk as far as Philadelphia (26km) on the N7 and sleep over. I did put word for a place to rest for the night but have not had any feedback but as the town’s name mean “brotherly love” I am sure when I get there somebody there will give me some brotherly love with a bed to sleep in and to rest for the night. Friday morning I will walk the remained of the +- 20km to the Moreson farm 10km from Malmesbury . If I get there early will remain on the N7 at the entrance interceding until just before 6pm when the main opening service of the conference start. I am excited to walk the N7 over the next 2 days. Please pray for me and trust the Lord for many people to come to Jesus and many that will stop and be prayed for and all seeds sown to bear much fruit. There is suppose to be rain in the morning leaving here but in Jesus name I thank you Lord that you will carry me through this as it is for your glory. Winnie will remain behind in the caravan in Tableview where we parked at the moment and I am trusting the Lord for a lift to the farm for her so that she can join me for the 9am service, If anybody is going that way contact us as we would appreciate a lift that way. God is awesome and looking forward to a blessed weekend. On 3 different occasions while walking with the cross God send somebody across my path that said i should walk to the Mighty men Conference in Malmesbury. i take that as confirmation that that is what the Lord want me to do. 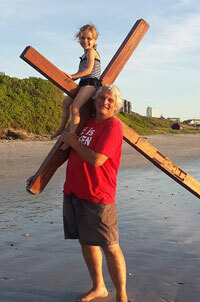 i was also contacted by PiperJames one of the organizers and ask if i would like to walk the last km with the guys bringing the revival torch from Table Mountain to the conference to light a revival torch at the opening of the conference. The route i will follow is on the N7 leaving Table View Thursday morning the 22 September with a sleep over in Philadelphia 24km from my start. At this time i don’t have anywhere to sleep in Philadelphia as yet and trust the Lord will provide. Friday morning i will walk the remainder of 20km to Moreson farm. If anybody want to join me for a while you welcome to do so but i also ask that you pray for us as we walk. We trust the Lord that many people will come to Jesus and stop for prayer during this time.